This item only consists of 3 tubes! The Vet's #1 Choice Against Fleas and Ticks - Dog, cat, puppy or kitten, it's easy to see why FRONTLINE® Brand Products are the #1 choice of veterinarians to control fleas and ticks on your pet. Sometimes, pet owners think that their animal couldn't possibly have fleas or ticks. The reality is that every pet, dog or cat, is at risk for fleas and ticks. Even indoor cats are at risk for getting fleas, especially if cats share a household with dogs. Cats are constant groomers, so fleas are not always as obvious as they are on a dog. Because it is waterproof, FRONTLINE is ideal for dogs and cats providing ongoing protection, even if your pet is caught in the rain or has a bath. How FRONTLINE® Brand Products Work - From the very first application, FRONTLINE kills up to 100% of existing fleas in less than 24 hours and continues to provide fast-acting, long-lasting flea and tick control. Fipronil, the active ingredient in all FRONTLINE Brand Products, is stored under your pet's skin, in the oil glands, so FRONTLINE continuously reapplies to the skin and hair through the hair follicles making it waterproof. FRONTLINE will remain waterproof and won’t rinse off – even through your cat’s self-grooming or your dog’s monthly bath or swim. In fact, FRONTLINE doesn't stop working for an entire month, giving your pet non-stop flea and tick control. 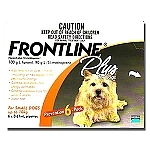 FRONTLINE starts killing fleas and ticks as soon as they come into contact with your dog or cat. FRONTLINE Plus also keeps future fleas from biting by killing flea eggs and larvae before they mature. With FRONTLINE Plus or Top Spot®, you get control of both fleas and ticks in one, easy application. 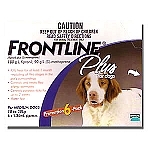 And, FRONTLINE Plus and Top Spot are gentle enough for use on puppies and kittens as well as pregnant and nursing mothers. Simply squeeze FRONTLINE Plus or Top Spot between your pet's shoulders and the active ingredient, fipronil, dissolves into the natural oils of the skin and coat. From there, it quickly spreads over your pet's entire body to provide long-lasting, waterproof flea and tick control that keeps working for an entire month. 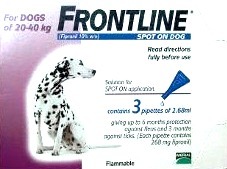 Please be sure to read the following instructions carefully before applying FRONTLINE Plus or Top Spot to your pet. Remove applicator from child-resistant package. Use scissors, or lift and remove plastic tab to expose foil, then peel down. Open applicator. Hold upright and snap applicator tip away from face and body. Apply FRONTLINE. Place applicator tip through your pet’s hair to the skin level between the shoulder blades. Squeeze applicator, applying entire contents in a single spot to your pet’s skin.